If you’re like us, you enjoy hiking, but don’t necessarily want to commit a whole day to hiking. We’ll do an occasional day hike, but typically we prefer to spend 1-3 hours hiking and then move on to another nearby activity. This is precisely what we did during a recent visit to the White Mountains in New Hampshire. So, if you’re looking for short and/or easy hikes in the White Mountains, you’ve come to the right place! 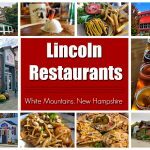 Besides hiking in the White Mountains, there are so many other awesome things to do in this beautiful region of New Hampshire. So before you go, be sure to check out our Things to Do in the White Mountains post. We’ve compiled a list of relatively easy hikes in and around White Mountain National Forest. Many (but not all) of these hikes are considered family friendly; easy enough for young children. Looking for a challenge? There are several monster summits to be climbed in the White Mountains. Want a multi-day hike? 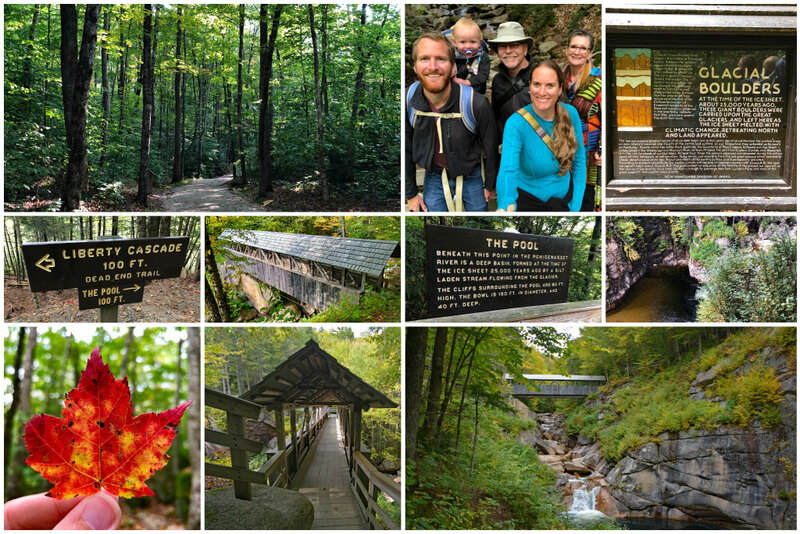 170 miles of the Appalachian Trail cuts right through the White Mountains! However, for the sake of this post, we’re sticking with the best hikes in the White Mountains ranging from 0.5-4 hours. Artists Bluff is a 1.5-mile loop hike located in Franconia Notch State Park within the White Mountain National Forest. It is ranked easy to moderate in level of difficulty. There are a few steep portions and some boulders to scramble over. Because of this, we wouldn’t recommend this hike for small children (unless they are in a baby carrier backpack, like our son). Plan on 1-2 hours for this hike, with an optional short, but steep climb to the summit of Bald Mountain. To find the trailhead, take Exit 34C (Route 18) from the Franconia Notch Parkway (I-93) and turn left. Drive a half mile to a large unpaved parking area on the right (across from the Peabody Base Lodge). Toward the back of the lot, you’ll see a break in the trees and a small sign marking the trailhead. Grab some snacks and plenty of water and get ready to explore one of the best hikes in the White Mountains! This rocky trail leads to some pretty incredible vistas! A quarter-mile into the hike, you’ll come upon a sign pointing left for Bald Mountain and right for Artists Notch. The path left is a short, yet steep scramble to the summit of Bald Mountain. The final climb is not for the faint of heart, but the views are worth the exhilarating ascent. You are, of course, welcome to skip this portion of the hike and head right toward Artists Bluff. You’ll know you’re near the bluff when you come across a rock with the word Bluff painted in red pointing you in the correct direction. The bluff provides unrivaled views of Echo Lake, Cannon Mountain, and Franconia Notch. 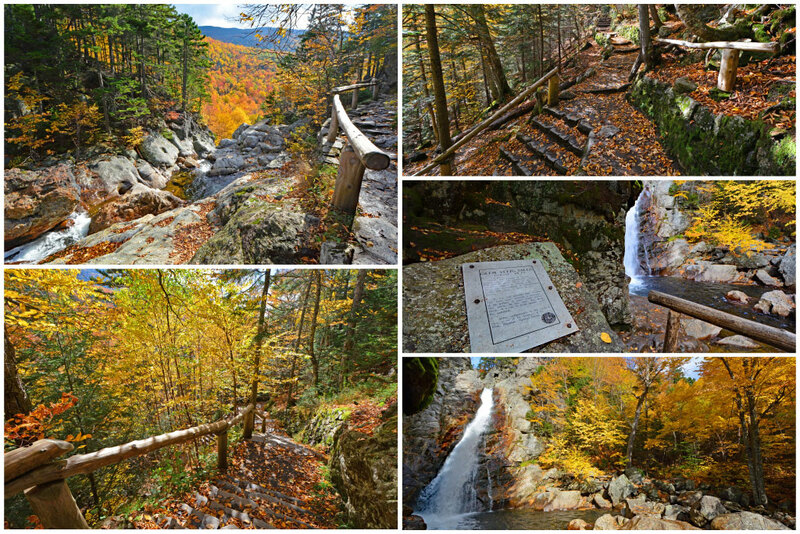 No wonder it’s often referred to as the best hike in Franconia Notch State Park. It’s also a favorite location in the White Mountains for watching the sunset. Once you’ve taken in the views at the bluff, continue on the trail which will put you out along Route 18 back in the direction of the parking area. Artists Bluff is a great hike to pair with a ride on the Cannon Aerial Tramway just a short drive away. 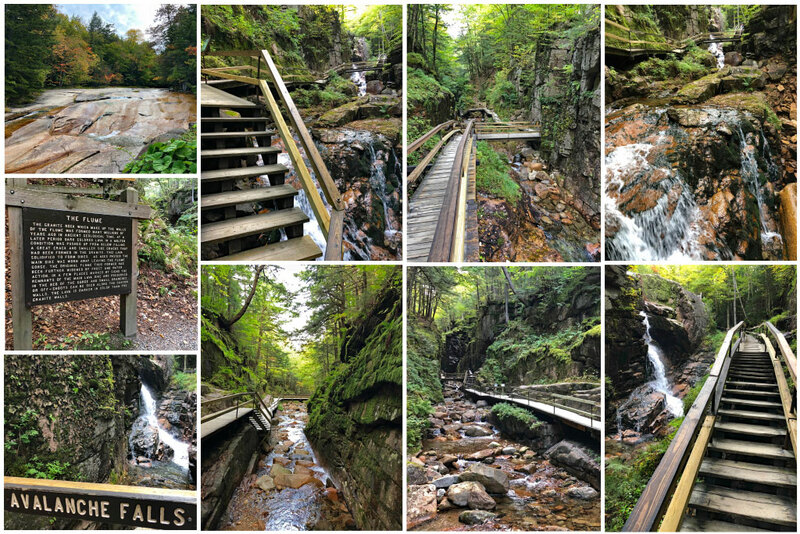 Flume Gorge is one of the most popular things to do in the White Mountains. You must pay a nominal admission fee, but it’s an incredible White Mountains hike you do not want to miss! TIP: Planning to do a lot of activities during your visit to the White Mountains? Consider purchasing a White Mountains Attractions Value Pass to save close to 70% on admission prices to 17 White Mountains Attractions! Or if you at least plan on riding the Cannon Aerial Tramway, purchase a Discovery Pass which will give you discounted admission to both the tramway and Flume Gorge. A visit to The Flume starts with a stop at the Gilman Visitor Center. You can opt to take a shuttle from the visitor center to the start of the Gorge or you can simply walk the 0.7 mile trail to get to the start of this natural wonder! While the trail leading to the Gorge is wheelchair accessible, the Flume Gorge hike is not. There are many stairs. Once in the Gorge, take time to read signs that explain how the Gorge was formed, and how it was discovered back in 1808. 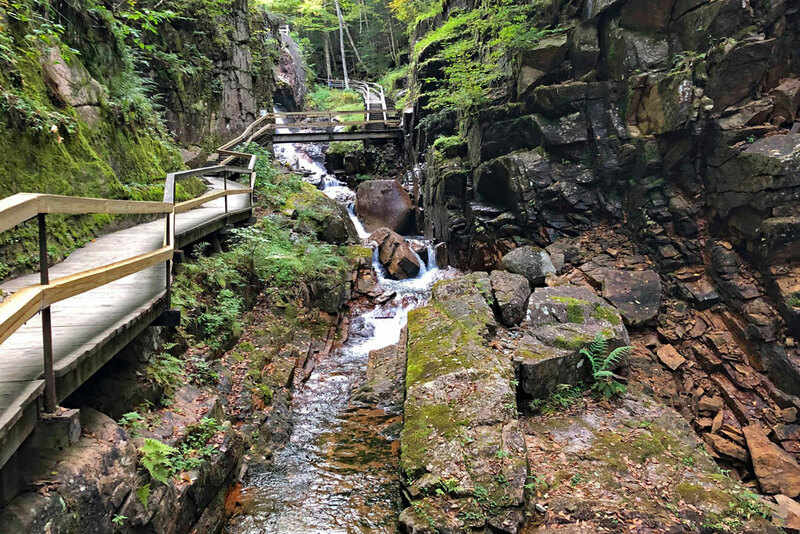 If you’ve got kids with you, print out this Flume Gorge Scavenger Hunt created by NH Parks & Recreation Department, before you visit Flume Gorge. Upon leaving the Flume Trail, continue on the nature trail for a total of 2-miles, visiting other points of interest, including Liberty Cascade, The Pool and Sentinel Pine Bridge. For more information, including Flume Gorge hours and ticket prices, visit the Flume Gorge website. 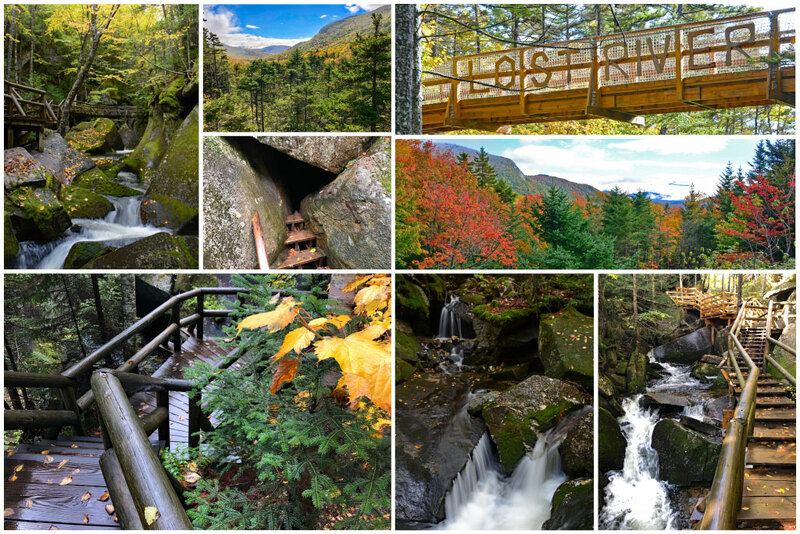 Lost River Gorge & Boulder Caves is another easy to moderate walk in the White Mountains that requires an admission fee. (It’s also included in the White Mountains Attractions Value Pass.) 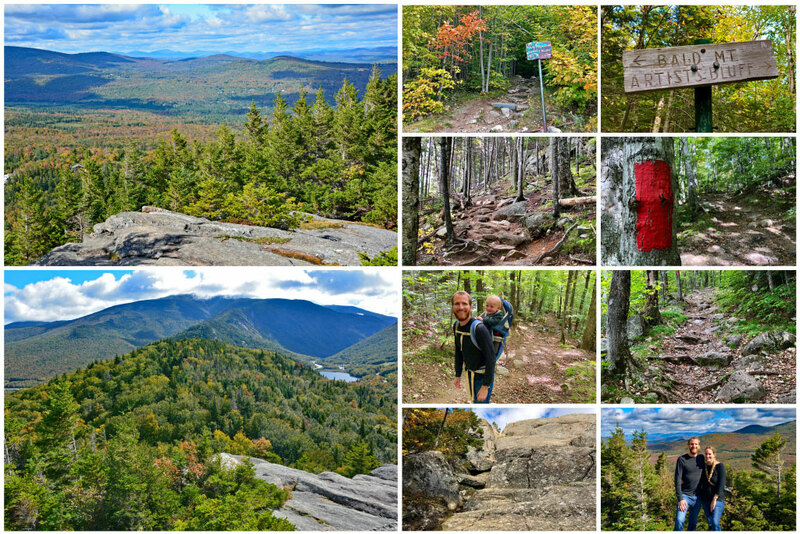 Don’t worry, we’ll cover a lot more FREE White Mountains hikes throughout this post! 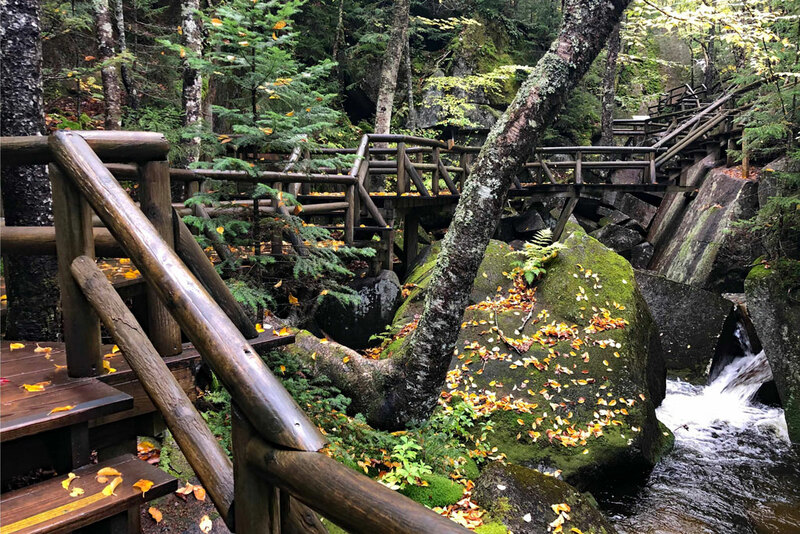 Lost River Gorge offers a 1-mile loop trail on a boardwalk meandering along and above the Lost River in Kinsman Notch. More than 1,000 stairs await you, so this hike unfortunately is not suited for strollers or those with mobility issues. Along the path are several boulder caves that only the adventurous and flexible should attempt squeeze through. However, you are more than welcome to skip the caves if you’re not feeling too nimble. Along the trail you’ll also find a treehouse, giant bird’s nest lookout, and a suspension bridge. So again, this is a great family friendly hike that the kids will really enjoy! Like Flume Gorge, Lost River Gorge is open daily (weather permitting) from mid-May to mid-October. For more information, including hours of operation and ticket prices visit the Lost River Gorge website. Glen Ellis Falls is one of the best short hikes in the White Mountains because it offers an incredible pay off! Just a quarter-mile hike will bring you to a cascading 65-foot waterfall. The falls are located off NH-16 (Route 16) in Pinkham Notch not too far from Mt Washington. From the parking area, follow the signs leading you under the highway via a pedestrian tunnel. Once on the other side of the highway, you’ll walk alongside a rushing river that leads to the scenic falls. There are two different viewpoints for this popular New Hampshire waterfall, so be sure to visit both. It’s a short but semi-steep hike with a lot of stairs. The walk down to the falls is easy, but the journey back up may leave you a little out of breath. Glen Ellis is a great family friendly hike due to its short distance. It is recommended to pair this hike with a drive on the Mount Washington Auto (Toll) Road. Follow the signs to the parking area for The Basin off I-93 in Franconia State Park to get to this popular hike in the White Mountains. You’ll walk a quick jaunt on the Pemi Trail, along the Pemigewasset River, where you’ll see The Basin, a short waterfall cascading into a deep whirlpool. A short distance later, you’ll come upon Baby Flume, a small but picturesque waterfall. From there, you’ll intersect the Basin-Cascades Trail, a relatively flat mile-long (each way) out and back trail that will take you approximately 1-1.5 hours to complete. Stroll alongside the Cascade Brook as it drops a total of six hundred vertical feet over various waterfalls and smaller cascades. The first officially named waterfall of the Basin-Cascades Trail is Kinsman Falls. This narrow 15-foot waterfall plunges into a swimmable pool. Toward the end of the trail, Rocky Glen Falls cascades 35-feet over two rock segments. Previous hikers have mentioned that the Basin-Cascades Trail can become quite muddy after a rainfall, so keep that in mind and wear appropriate footwear. There used to be a bridge connecting this trail to Lonesome Lake. However, that bridge was destroyed in a storm and it is recommended that you access the Lonesome Lake trail from the Lafayette Place Campground, as we’ll discuss next. The trailhead for Lonesome Lake is found at the Lafayette Campground off of I-93 South. This 3-mile well-marked, well-traveled loop trail starts from the left side of the parking lot at the campground. (Please see our Tips for Hiking in the White Mountains section below for information about the Franconia Notch Hiker Shuttle, as parking inside the campground is limited to campers only.) The terrain starts out mostly flat through the woods. After about a mile, you’ll see a turn off (to the right) for High Cannon Trail. Continue on the Lonesome Lake trail. A fairly steep portion of the trail (complete with switchbacks) brings you up the side of Cannon Mountain. Following this section, the ascent becomes more gradual. Because of the steep ascent, this hike is probably more well suited for older kids. Once you get to the top, follow the Cascade Brook Trail along the south side of the lake. Carefully traverse over secure hardwood planks as you make your way around the lake (~0.8 mile). Throughout this moderate hike, you’ll be rewarded with beautiful views of Lonesome Lake (obviously! ), Franconia Ridge, Mount Lafayette, and Mount Lincoln. Hikers have mentioned that this trail can become quite muddy, so always be sure to have appropriate footwear. It is also recommended that you bring cash to purchase a delicious treat from the hut. 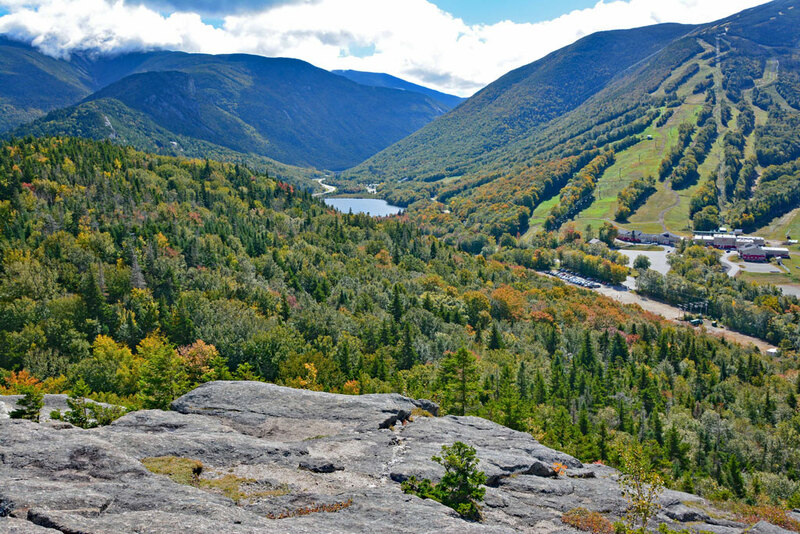 Want stunning panoramic views of Crawford Notch? Head on up to the summit of Mount Willard! 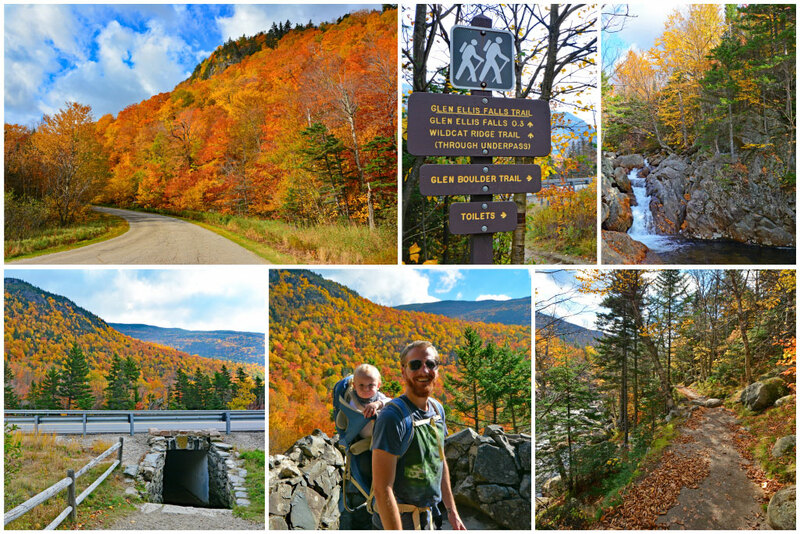 To get to the Mount Willard trailhead, take Route 302 East to the Crawford Notch Railroad Station (Appalachian Mountain Club (AMC) Crawford Notch Visitors Center). The 3.2-mile out and back family-friendly trail starts behind the old station and should take roughly 2-3 hours. You’ll experience an elevation gain of close to 1,000 feet. The trail can be steep at times, but according to countless travelers who have made the trek, the views are worth the effort! Oh, and if you’ve got a 4-legged friend you want to bring along, dogs are permitted on the Mount Willard trail. 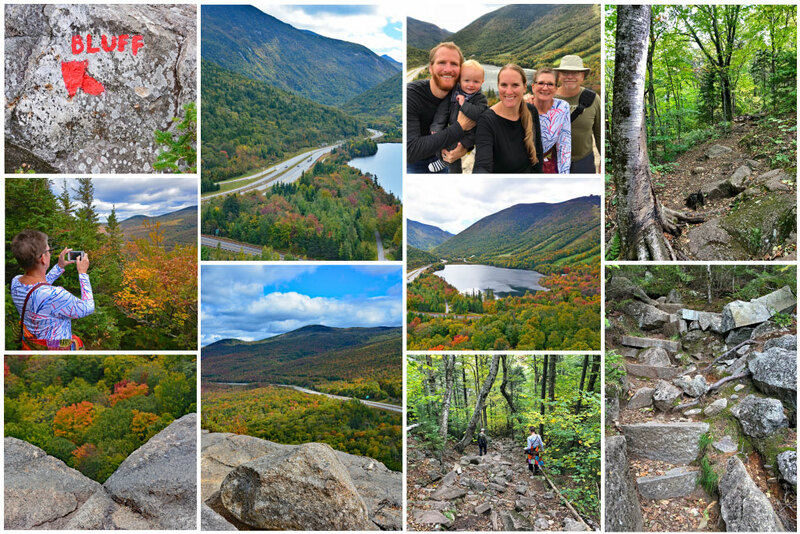 For an easy family friendly hike that also offers sweeping views of Crawford Notch, take a stroll on the Elephant Head Trail. It’s only about a third of a mile each way, so you won’t need much more than a half hour. You’ll see the parking lot for the trailhead pretty much immediately after passing the Crawford Notch Railroad Station (right) and Saco Lake (left), if coming from the direction of Twin Mountain. From the trailhead parking lot, you’ll be able to see the giant rock formation that resembles an elephant’s head. The trail starts across the street from the parking lot. With less than a 200-foot elevation gain, it’s the perfect hike if you have small children. Dogs are also welcome on this trail. As you drive out of the heart of Lincoln and begin your journey on the Kancamagus Highway, you’ll see the turn off for the Lincoln Woods Trail on your left. Because the trail lies within the White Mountain National Forest, you’ll need to obtain a National Forest Recreation Day Pass (more on that in the Tips for Hiking the White Mountains section). There is ample parking (and restrooms) at the Lincoln Woods trailhead. Many trails that run throughout the Pemigewasset Wilderness start here, so you may notice offshoots to several other trails along the path. From the parking lot, follow the marked trail and cross over the picturesque suspension bridge. You’re now walking on a former railroad bed alongside the East Branch of the Pemigewasset River. Though the trail is easy, the views may be a little lack-luster compared to some of the other trails we’ve recommended thus far. It’s a mostly flat trail, so many adventurers choose to bike the trail. It’s 3.2 miles each way, making it a 6.4-mile hike round-trip. Most people go the full 3.2 miles in order to see the beautiful Franconia Falls toward the end of the trail. Depending on how far on the trail you choose to go, the hike should take anywhere from 1.5-3 hours. 2 miles down the road from the Lincoln Woods Trailhead on “The Kanc” (the Kancamagus Highway), just past the Big Rock Campground, is the family-friendly, wheel-chair accessible Discovery Trail. This 1.4 mile loop trail represents a living classroom. Pick up an interpretive brochure at the trailhead and get ready to discover natural and managed forest ecology. Want to access a copy of the guide before you hit the trail? CLICK HERE! 12.5 miles from the Discovery Trail is the trailhead for Sabbaday Falls, a 45-foot waterfall in the heart of the White Mountain National Forest. This 0.7-mile (out and back) trail is accessible for wheelchairs and strollers, as it is made up of gravel. The elevation gain is less than 100 feet, so it’s considered a very easy, family-friendly hike. Leashed dogs are permitted on the trail. <3 miles from Sabbaday Falls is the Russell Colbath House (which shares a parking area with the Passaconway Historic Site). The 0.5 mile River ‘n Rail interpretive trail is located just behind the house. Step back in time as you discover the history of the surrounding area. Due to its short length, in addition to the wide crushed stone path and wooden bridges, this trail is considered to be wheelchair and stroller friendly. It should take no more than 30 minutes to explore the Rail ‘n River Trail. This 2.4-mile loop trail starts from a dirt parking area at the peak of Hurricane Mountain Road in Intervale, near North Conway. Stroll through a spruce and beech forest as you make your way to a rocky summit where you’ll have spectacular views. On a clear day you’ll be able to see Mt Washington and other prominent peaks in the White Mountains of New Hampshire and Maine. Allow 2-3 hours for this hike. 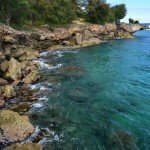 The short hike to Diana’s Baths is relatively flat, so it’s a great hike for people of all ages. It’s just over 0.5 mile to get to the 75-foot rocky cascade from the parking area off West Side Road in Barlett, near North Conway. The hike itself will take less than an hour out and back, though you might want to stay for a while to enjoy the tranquility of the surrounding nature. Dogs are permitted on this trail. Purchase a National Forest Recreation Pass for your vehicle when accessing trails that are within the White Mountain National Forest. (If you have the America the Beautiful (Annual/Lifetime National Park Pass) you’re covered.) 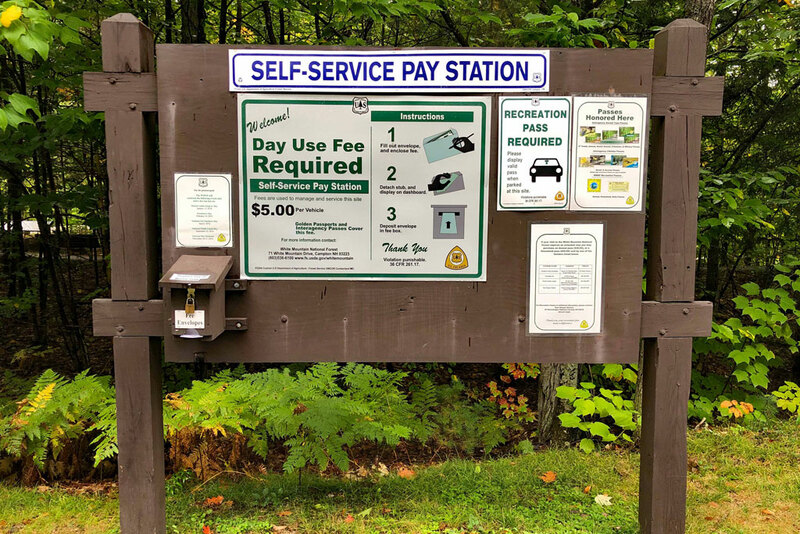 Many of the popular parking areas/trailheads have envelope pay stations (see image above), so make sure to have the correct amount of money. The passes are currently $5/day* and are good throughout the forest for the entire day. You can also purchase a pass at local area business, US Forest Service Information Centers, and at the White Mountains Visitor Center. Annual National Forest Recreation Passes are available for $30* single/$40* household. *Prices are subject to change. Look into the Franconia Notch Hiker Shuttle. Parking in Franconia Notch State Park can be very limited, especially during the busy summer months. As a result, the park is now offering a shuttle service when the lots get full. Please note, it is not legal to park on Franconia Notch Parkway (Route 93) and doing so could result in a fine. For more information about the Franconia Notch Hiker Shuttle service, please CLICK HERE. Wear comfortable and appropriate footwear. You could be scrambling over rocks, tree roots, and other uneven terrain. Trails can be muddy. Flips flops and sandals are NOT RECOMMENDED. Hiking boots with ankle support are recommended, but low-cut sneakers with flexible midsoles could also work for most of the trails mentioned here. 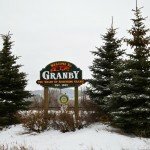 Need extra support for hiking in the White Mountains? Consider a pair of hiking poles. Snowshoes or shoes with spikes are recommended if you choose to do any of these White Mountains hikes in the winter months when heavy snowfall is common. Check the weather. It’s probably best to avoid walking over rocky trails when it’s raining, as it makes for a slick terrain. Protect yourself from the elements. We don’t go anywhere without our trusty sunscreen or bug spray. Stay hydrated and bring plenty of snacks. We absolutely love our Life Straw Water Filter Bottles. It’s like carrying around our own water filtration system. When you run out of water, just fill up in a nearby stream and your Life Straw’s hollow fiber membrane will remove 99.999999% of bacteria (including E. Coli and salmonella) and 99. 999% of parasites (including Giardia and Cryptosporidium) and Micro plastics. Plus, when you purchase a Life Straw product, a school child in need receives safe drinking water for an entire school year! So, everybody benefits! Leave no trace. Take out what you bring in. “Take nothing but pictures, leave nothing but footprints.” It goes without saying, please do not litter. Bring a trail map or use the GPS on your phone. Most trails are very well marked, but you certainly don’t want to get lost in the White Mountains! We wish you a wonderful time as you hike the White Mountains! And don’t forget to check out our Things to Do in the White Mountains post.